On day 1 you learned that D10 was a lovely golden ball in space with a very important visitor named Cassini. You probably went right to the Cassini mission website and saw this early picture. 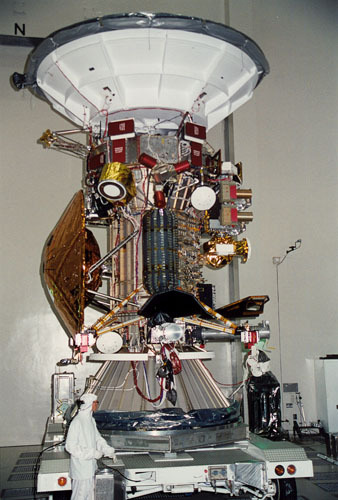 Although Cassini is managed by a committee of three (NASA, ESA, and ASI) it turns out to be a pretty amazing spacecraft, with its own eyes, legs, arm, hands, voice, and brain! Need a little help finding them – no problem. Just click here for a guided tour by our old friend NASA. 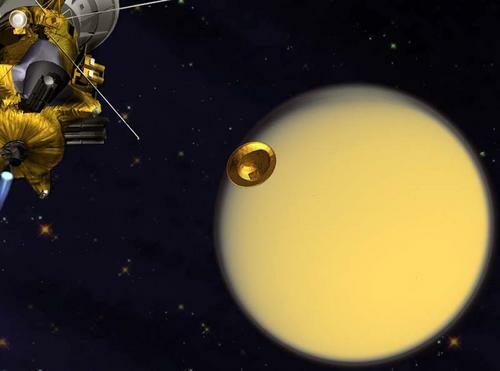 For sure, you found out that Cassini has been exploring Saturn and its 62 moons for fourteen years. 62 MOONS !!! You thought. Oh my gosh! How am I ever going to figure out which moon is D10? On day 3 you found out that in 2005, D10 was tickled by a probe. You went right back to the Cassini site and found this artist’s drawing of the Huygens Probe heading for Saturn’s largest moon. Ah-ha! you say. And rightly so, for you have just solved another astounding Space Game mystery. And your reward — click now for a ride on a very cool virtual tour (courtesy NASA) of Saturn’s spectacular moon…. Is this the moon that they found Ice in and thought might have life deep inside? Hey, Dr. Spaceman, good to hear from you again! I bet you’re thinking of one of Jupiter’s moons, Europa. It was SpaceBlogs Destination Eight and the subject of four prior posts. Scientists do think Europa may have a liquid water ocean hidden under its frozen surface. That along with heat energy (from Jupiter’s powerful gravitational pull) and organic molecules (brought by comets) might indeed make Europa a haven for life. Thanks for the great comment!